I admit, I have obsession on certain style of soaping from time to time. There was a period when all I wanted to do was layering, from simple one color gradient to complicated tri-color alternating 11 layer gradient, I was totally obsessed for awhile! 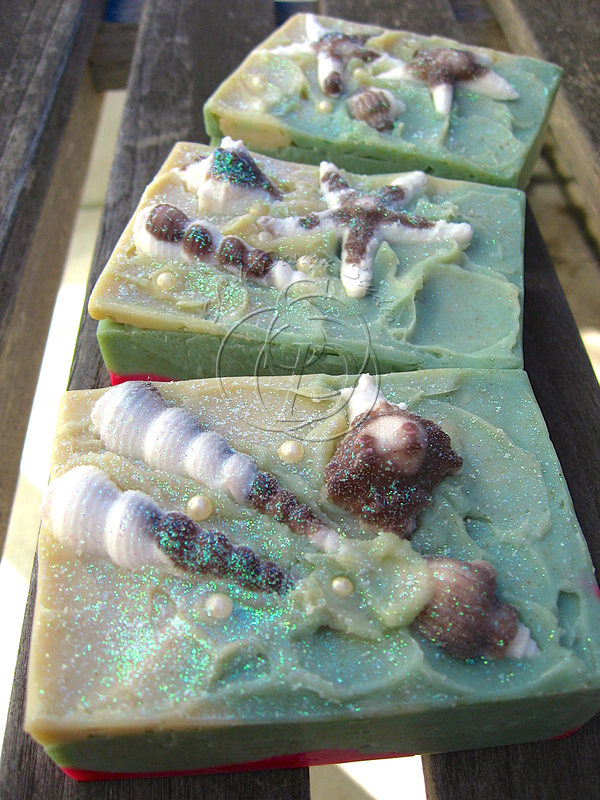 It seems like lately I've switched my obsession to the soap top decoration, to be more specific, the use of sugar pearls and oil mica swirl. 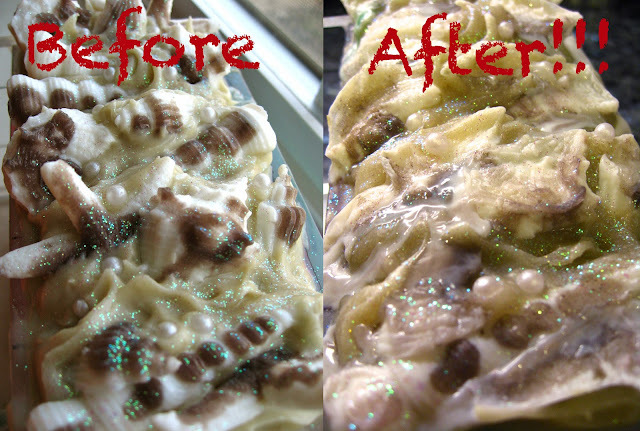 What is oil mica swirl you ask? It is simply mixing body safe mica or glitter with little oil to drizzle over the soap top then either swirl it with a stick or spoon. 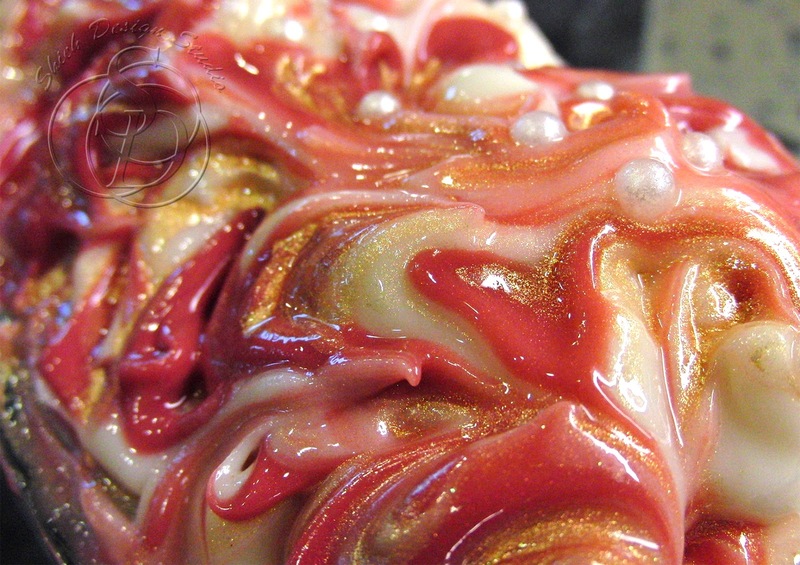 After soap sets up hard, the oil you use to mix the mica gets absorbed into the soap and creates a trace of shimmery mica or glitter behind for some bling bling! Normally when you mix shimmery mica into soap batter you get the coloring but not the shimmer or glitter. 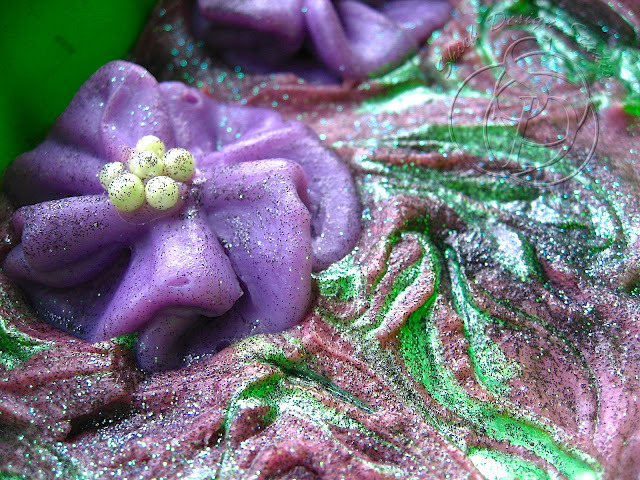 By doing oil mica on soap top you can add a lot more visual interest to the look. What is Sake? It is rice wine in Japanese. There are many kinds of rice wine, some are good to drink in room temperature, some are good to drink chilled, and some need to be warm. We love going to sushi bar eating sashimi and sushi and pair it with sake! Try it, you will like it! I've tried using liquor to make soap before, actually quit a few, like red wine, champagne, rum, and beer, so why not sake?! I boiled a cheap bottle of sake the night before and chilled in the refrigerator. The next day when I mixed sodium hydroxide in the sake the whole thing turned bright orange! 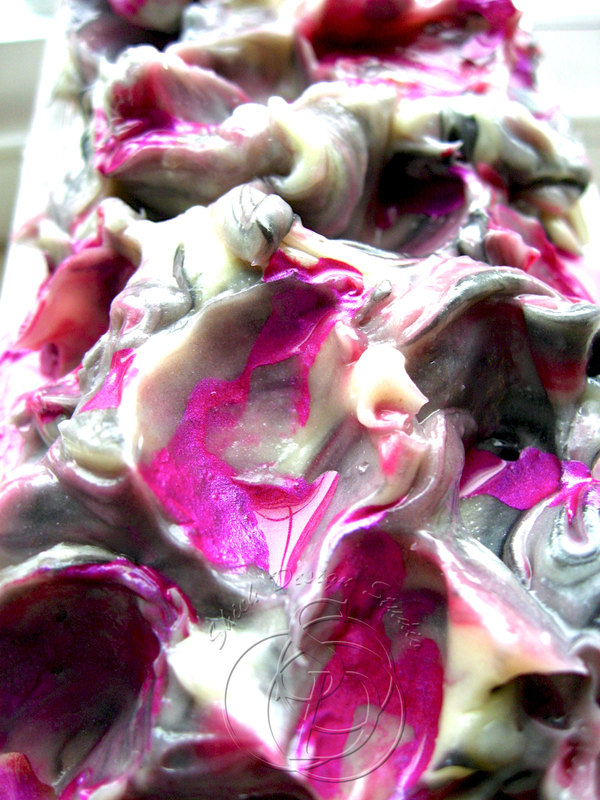 I'm pretty sure it was the sugar in the wine, just hope that it would not affect the colors of my soap because purple is the color of this Violet Rose soap! Those purple flowers were pipped a few days ago. I'm trying to practice pipping flowers with soap. They are not exactly what I planned but still good. It is very hard to imagine the finished color when your started with a heavy colored lye solution. All my purples became kind of muted looking. I could not tell if I need to add more red or more blue or what. See how bright the pipped flowers are? Well, I guess the lye solution color did indeed affect the outcome of my purple... sigh. My purple looks muted now. But, it smells great at least! We often run into situation when people say the product photo is misleading, it is not the color they thought they bought! I'm going to point out the fact that everything does look differently in different lighting, not just on the photos, but we experience it in real life every minute. When we sell a product, we obviously want to present the best angle the product can look online. Does that mean the photo is deceptive? Maybe there are cases that can be true. But often it is caused by different lighting. For example, I took photos of the soap on the same wooden table outside my backyard only few minutes apart and rotated to get different angles of lighting. 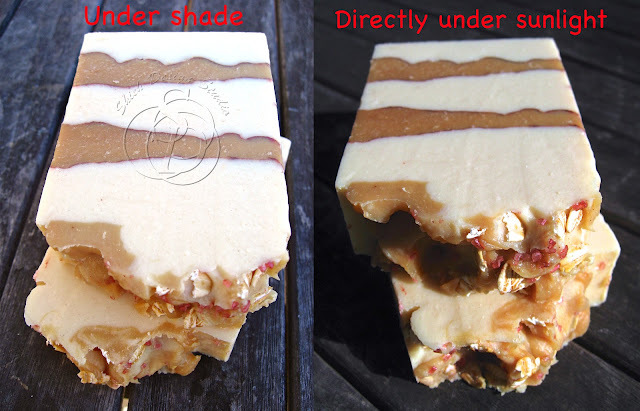 When the soap is under direct sunlight, the contrast and color saturation are over the top. But when I turned the soap to let it be under shade from another angle, it looks totally different. If it's my choice to list this product for sale, I usually chose the one on the left. But that's not to say the photo on the right is misleading or deceptive. Objects do look more saturated and ultra contrasted under direct sunlight in real life. In fact, the same object will never look the same in real life, the color balance and contrast are always changing. It is not a right or wrong situation, it's more like preference and choice. 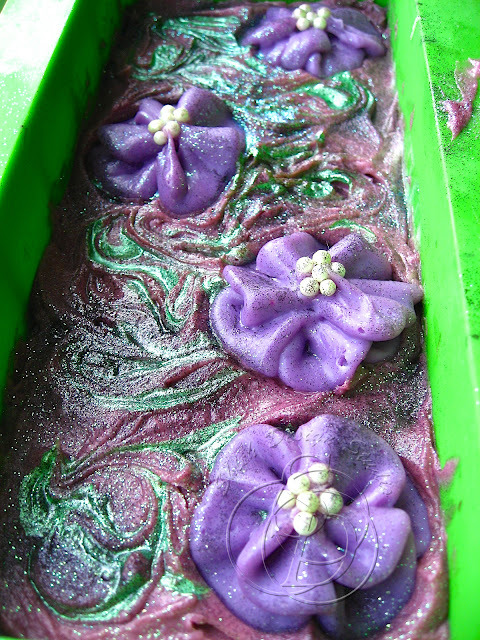 If I have a vision of what a soap is supposed to look like I'm kind of stubborn on getting it right. Failure on the first try will only fire me up! 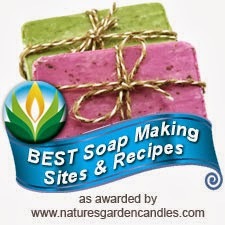 The next day after my careless mistake that melted my carefully designed soap top, I decided to give it a second chance. Ok, maybe I'm being too harsh on the soap, maybe this should have been categorized as human error... this is more like giving myself a second chance! I'm pretty happy with my second chance here! PS. 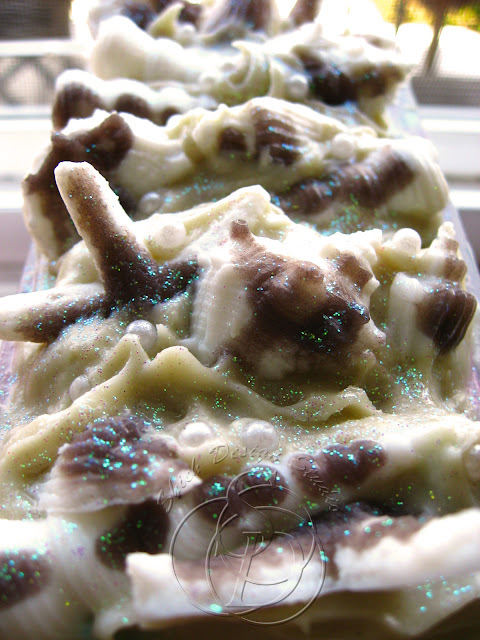 It might seem like I intentionally made it look like shells being washed up to the sandy beach by the ocean... Little did you know that it's another last minute implementation I had to make because I misjudged the amount of "sand" I need to fill all soap tops! Oops... But I'm quit happy with this accidental result, more so than my original plan! First Soap of the Year - What a Bad Start! Back to reality! Came back from paradise, partially bored, guess relaxing beach side isn't really for restless me. I got eager to soap, can't wait to put my vision to work! Everything seemed to work smoothly through the process, surprisingly no hiccups. I even video taped myself! Seaside Cotton Soap, I now declare war on you!